AMS Performance Intercooler Kit - Dezod Motorsports Inc - Home of the automotive performance enthusiast since 2002. 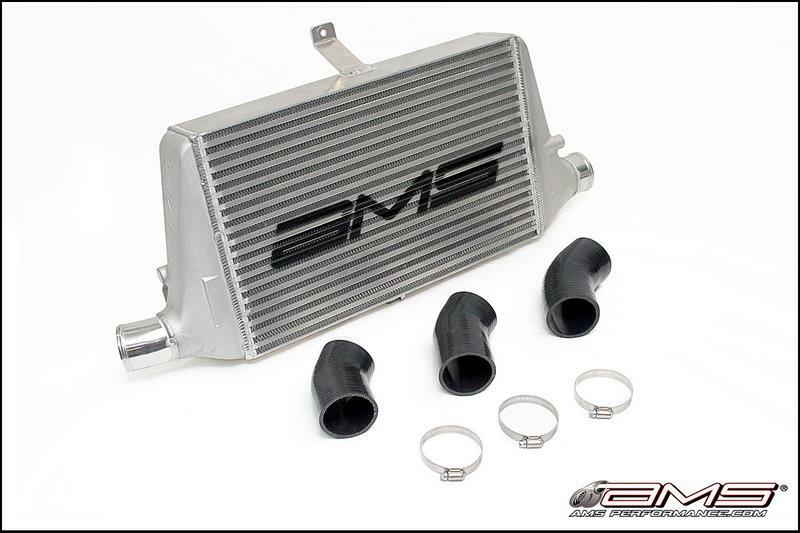 The AMS Performance Intercooler Kit is the best performing direct bolt on you can buy. This is the same durable, race proven intercooler core we used on our record setting Time Attack EVO, proven efficient to 650 whp. Our intercoolers have 50%, 80% and even up to 160% more internal flow area than its stock counterpart, works with stock and even some aftermarket piping ! Let the competition know that you means business with a genuine AMS Intercooler but be warned the intimidating AMS logo may scare them off! This AMS Intercooler now features cast aluminum end tanks for added durability with smoother features and geometry. Designed by our engineering team using Solidworks (3D CAD software) these A356 T6 Alloy Aluminum end tanks have improved flow over sheet metal end tanks and include gusseted brackets to prevent cracking or failure. We go beyond our competition to ensure quality. Each AMS Intercooler is hand TIG welded in a jig for a perfect fit and pressure tested to 50 psi to ensure maximum performance. We tested many intercooler cores to find the best performing core available. The super efficient AMS Intercooler out flows the competitions cores and provides better fitment. There are other “more affordable” intercoolers on the market that start but the STANDARD AMS Intercooler still out performs the competition. Do it right the first time, order your AMS Performance Intercooler Kit today! Will bolt up to your stock piping or any aftermarket pipe kit that is designed for the stock intercooler.